I can’t believe that I haven’t posted about this product before now; I think that because it’s such a staple product in my beauty regime it somehow got overlooked! Anyway, I’m writing about it now, so there we go – no harm done. I’ve been using Dermalogica’s Daily Microfoliant for over two years now, and I use it two or three times a week. Yes, I am well aware that the product should be used daily – the clue being in the name – but I can’t stand being told how often I should use something. (Obviously everybody wants you to use their products daily, twice daily and so on; but I’ll decide for myself thank you very much!) So, two to three times a week, my face gets the Microfoliant treatment, and I find that quite often enough to be buffing away at my face – I’m a great believer in the phrase “too much of a good thing”. Daily Microfoliant is a Rice-based powder that very gently exfoliates the skin’s surface to get rid of what Dermalogica calls ‘dulling debris’ and I call ‘dead skin and dirt’. Papain and Salicylic Acid also (apparently) help to get rid of dead gunk that’s hanging about by dissolving excess surface cells, and then the brightening bits and pieces get to work (licorice, rice and grapefruit) to help the skin look more radiant and to even out skin tone and pigmentation. Phew! I don’t know the chemistry behind any of this, but I do know that (on me, at least) it works absolute wonders – my skin is always much brighter and fresher-looking after it’s had a good scrub with this. I say scrub, but scrub really isn’t the right word… I can’t think of the right word. Buff, perhaps? Daily Microfoliant is a white powder that you tip into wet hands and work into a creamy paste – it’s not scratchy – you can hardly feel the particles at all. I prefer to mix my powder with just a little water so that the paste is a little thicker and I can really work it into my skin, but if you follow the instructions and add powder to ‘very wet hands’ then you’ll not notice anything ‘scrub-like’ about the formula whatsoever. Once you’ve formed your paste of choice (you have to carefully tip the powder from the container, do NOT get water in the container or the rest of the Microfoliant will be ruined), work it into your skin, avoiding your eyes. You’re probably supposed to mess about massaging for ages, but I spend around twenty seconds or so, and it works brilliantly on me! Rinse off and you’re done. My skin always feels a little tight after using this, but pleasantly so – a youthful, rejuvenated tightness! It goes without saying that you need to moisturise afterwards, and I always find that it’s a real pleasure to moisturise after using the Microfoliant – my skin feels really smooth and soft. Practicalities: a 75g container of Daily Microfoliant will last you absolutely ages. You only need about a half-teaspoon of powder at a time, and I reckon that I’ve had my current one for well over a year (NB: using twice/three times a week, not daily). The RRP is around £35, but I remember that I paid about £25 with delivery – the first three or so Dermalogica stockists that come up on Google usually have very competitive deals on Dermalogica products. £25 is an excellent price for such a long-lasting product, I think – especially one that delivers such great results. So, there you have it: one of my biggest beauty tips, the gentlest of exfoliants that really polishes and brightens, leaving you with smooth and glowing skin. I know lots of models who use this; it’s an instant fix to get the skin looking tip-top and make-up ready! 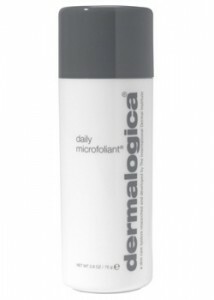 Dermalogica Daily Microfoliant, £28.99 from lookfantastic.com .